We are a privately owned, family run company based in Minnesota and specialize in providing natural and unique products to the veterinary industry. The Pavia Probe Covers are designed to fit the Pavia Rectal Temp thermometer. They also fit the Pavia Rectal Temp thermometer. Shipping: Free shipping with $150 purchase, otherwise $10 shipping charge applies. Product will be shipped within 3 to 5 days of order. Alaska, Hawaii, and international orders additional shipping will be billed. Please email us for a quote. Your privacy is important to us. Your information will not be shared or sold to any other person or company. 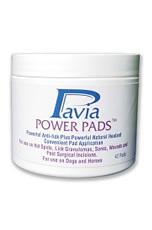 Are you a satisfied user of Pavia products? We'd love for you to share a testimonial with us. View and Add Testimonials Here!